Chef Robert is a cozy neighborhood restaurant located along the busy street of Banawe. Despite the noise and action that you get outside, you’d find peace and quiet the moment you step into his restaurant. I love the simple interiors as sturdy wooden tables are lined up with a long couch lining one side of the restaurant. 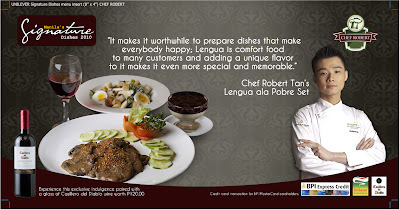 More often than not, you’d have Chef Robert Tan himself greet you as he personally mans his own restaurant. A short chat with him told us that his restaurant has been around for more than a year already. Surveying the crowd, it seems like has a steady stream of loyal customers mostly those living within the area. That evening, Chef Robert created a delicious dinner for us. The serving is quite big that it’s good for two. 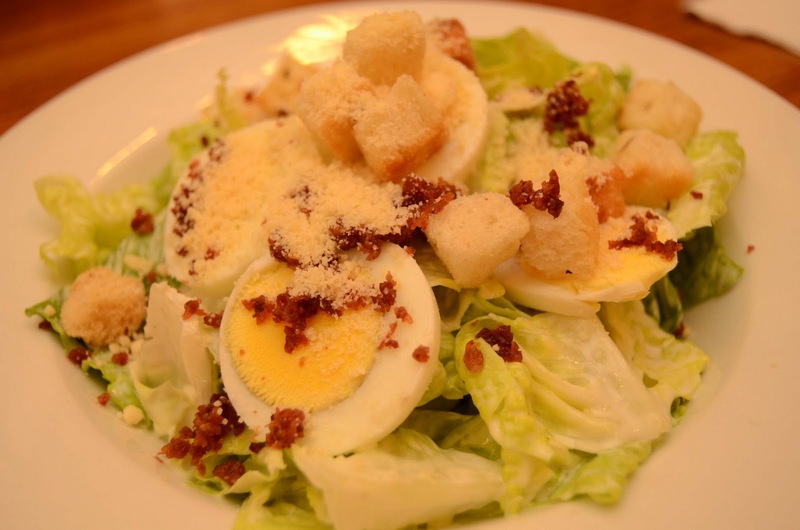 We began with his Ceasar Salad that makes use of Lady’s Choice Mayonnaise. Paul enjoyed this salad very much as it even has thin slices of boiled egg. The mayonnaise perhaps has made this salad extra creamy and at the same time giving it a sweet note. 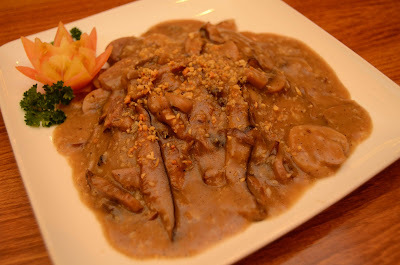 I was excited for our main course – Lengua ala Pobre. I love ox tongue and I never pass up the chance to get this whenever there’s an opportunity to do so. Growing up, I love Mario’s Lengua con Setas where I enjoy every bit of its tender ox tongue with creamy sauce and mushroom. Chef Robert’s version is loaded with garlic and delicious brown sauce. Despite not wanting to have rice that evening, I just have to give in to temptation as the lengua goes perfect well with steamed rice and veggies. Another indication that Chef Robert’s Lengua ala Pobre is truly spectacular is the fact that my husband, who has totally sworn off eating ox tongue after being terrified when he was a kid, enjoyed this dish and ended up finishing the last two slices. 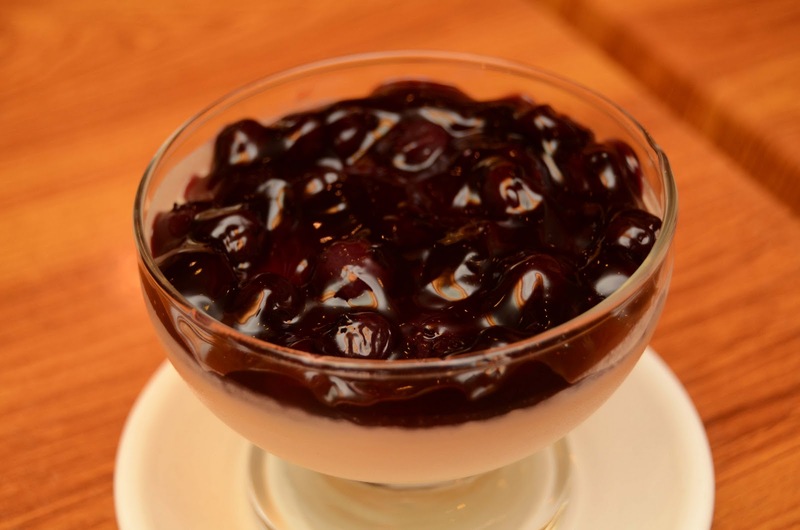 For dessert, we cap off our dinner with a huge bowl of Blueberry Panna Cotta. It tastes like our favorite blueberry cheesecake minus the graham crust. Panna Cotta seems to be one of Chef Robert’s best-sellers as we also saw the other table enjoying their own bowl of Panna Cotta as well. I am excited to visit Chef Robert again and to try his other specialties such as the Lasagna, Seafood Rice Melt and his Korean Beef Stew. Definitely a great place to unwind and bond with your special someone. Chef Robert is located at 847 Banawe street, corner Linaw street, Quezon City. 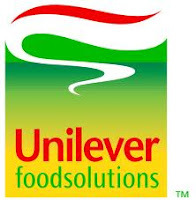 You may contact them at 740-9330 / 413-0674.